In addition to the discomfort, environmental allergies can do damage to your ears. If you are dreading the pollen this spring, you are far from alone. Over fifty million Americans suffer from allergies this time of year. In addition to the discomfort, environmental allergies can do damage on your ears. Here are a few things to watch out for and how to prevent them. 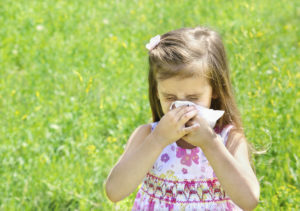 The most common symptoms of allergies are mostly nose-related; sneezing, runny or stuffy nose are all your body’s reaction to the allergens as it tries to flush them out of your system. In the same way, your ears may become stuffed up from excess wax buildup. That, combined with inflammation, can block your ear canal and prevent your Eustachian tube from draining properly. Your Eustachian tube goes from behind your throat and connects to your middle ear for draining excess fluids. It can become blocked from ear buildup or blocked sinuses. This can lead to infection and hearing loss. You’ve probably heard about the dangers of putting q-tips in your ear, but if allergies are making you itchier than usual then the temptation can be overwhelming. Irritation and itchiness in your ears could be from allergens or it could be the warning signs of infection. So please, resist the urge to dig out that itch and instead have your ears looked at by a doctor. Allergies can not only cause hearing problems, but they are very likely to worsen any issues that you already had. If you already suffer from tinnitus or Meniere’s disease, then you should talk to your audiologist about how you can protect yourself and prepare for the allergy season. The best way to keep your hearing from being damaged by allergies is to address your allergy symptoms first. Look for over-the-counter allergy remedies or get a prescription medication if need be and be diligent about taking them to reduce your symptoms. You can also lessen the blow by making sure that your house is dust free and that your air filters are up to date. And if you start feeling discomfort in your ear, see your audiologist. Stopping an ear infection early with antibiotics is a crucial step to prevent hearing loss. Contact Bay Area Audiology Today! If you are concerned about hearing loss or seeking hearing evaluations, tinnitus evaluations, or hearing aid assistance, our doctors are ready to help. We are passionate about helping all of our patients improve their quality of life through better hearing. We also believe that patient education is critical, so you won’t be led through endless sales pitches at our office. If you are interested in hearing how we can help you hear even better, contact us at (410) 838-4327 or online. For more hearing tips and articles, follow Bay Area Audiology on Facebook, Twitter, Pinterest, and LinkedIn. This entry was posted on Monday, March 25th, 2019 at 4:02 pm. Both comments and pings are currently closed.